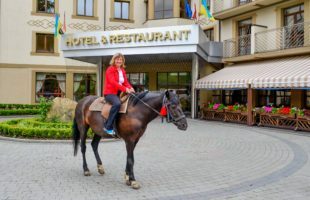 Hotels in the Carpathian Mountains with a pool are a great alternative to holiday in the Crimea. The hotel swimming pool is no substitute for the sea, but it is another, excellent way of spending a vacation. Especially if you take into account the great difference in service, catering, hospitality. 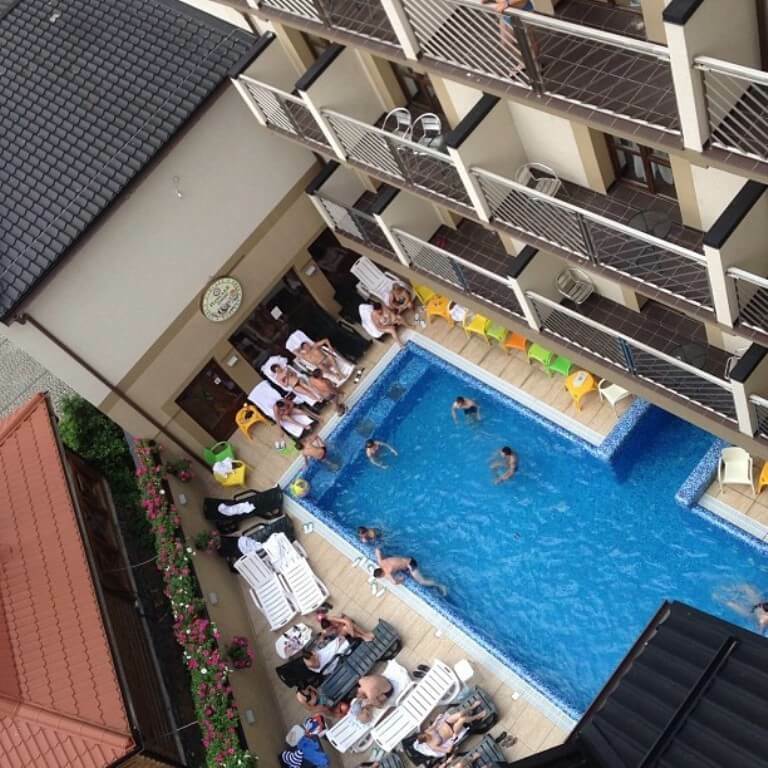 There is no hydromassage at the seaside and you can always order our “Panske” “live” beer of premium class, and enjoy your rest in a pool under the shadow of the Carpathian Mountains. SPA-POOL of the “Romantic Spa Hotel” is of European standard equipped with modern hydromassage equipment which will make you forget about all the problems, recover and improve your health. You will get a great deal of positive emotions from recreation in spa pools of “Romantic SPA HOTEL”. 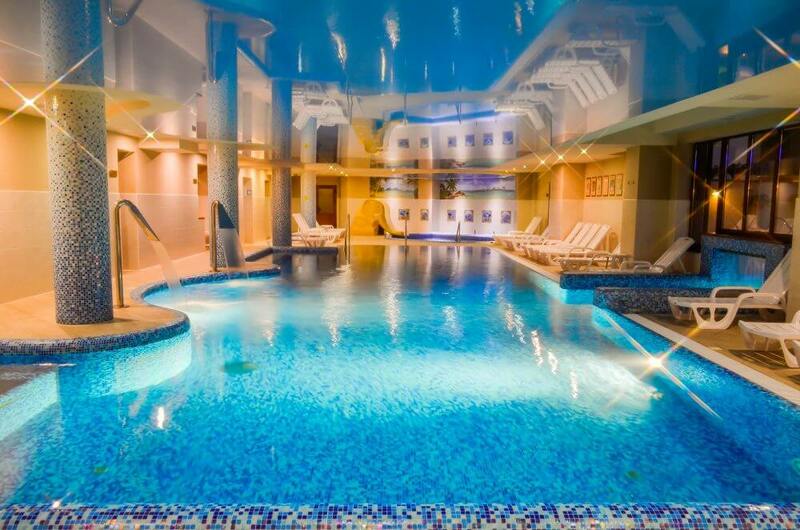 The indoor spa pool allows you to enjoy additional features of back, arm and body massage. This pleasant feeling of warm water brings not only delight but also use for your health. Our pools are equipped with the latest hydromassage facilities which help not only to relax the whole body, but also to massage certain points, conduce rejuvenation and recovery. 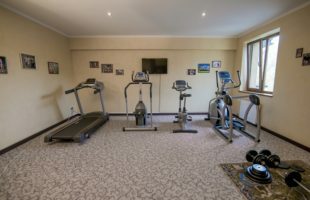 Also it provides guaranteed rest and recuperation after sports, fitness, aerobics, jogging. Our spa pool in the open air enables you to breathe the Carpathian air and watch the beautiful mountain scenery throughout the year. It is not cold in winter, as the required water temperature is set and therefore there is harmony between body temperature, water and air. And comfortable loungers allow sunbathing in the summer. 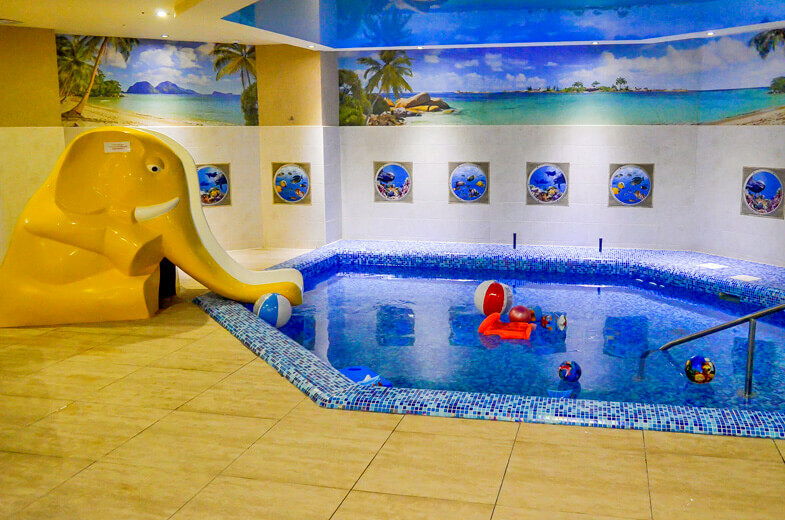 A wonderful spa pool with a slide will give your children a lasting impression and pleasant memories. The world of water games will bring joy to your children, and inflatable vests and swimming circles will make their stay in the pool comfortable and safe. 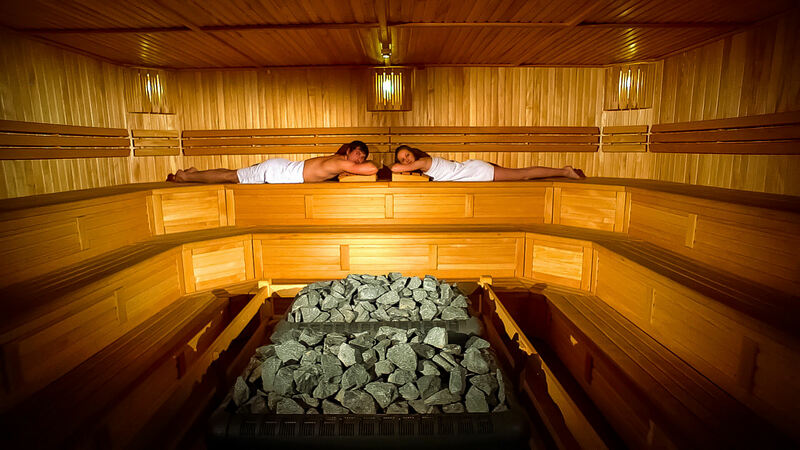 Since time immemorial, mankind believed in the healing effect of steam and sauna was considered to be a sacred place, where the spirit that gave everyone health and beauty hid. Warming up in the sauna leads to beneficial changes in the functional state of organs and body systems, strengthening metabolism. This is explained by the beneficial effects of heat on the cardiovascular and respiratory system. The sauna is furnished by ecologically clean tree varieties like linden and alder. The sauna can accommodate up to 50 people. 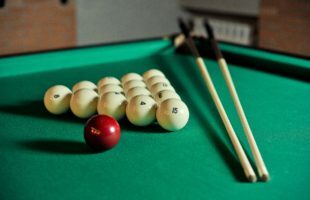 It is a perfectly comfortable place where you can forget tiredness and stress. The combination of massage and relaxing properties of ergonomic loungers with infrared heating provides tremendous therapeutic effect. In beer sauna the steam is dosed by natural “Panske beer” and a range of beer yeast is served for face and neck masks. 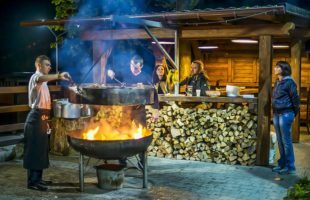 Visiting beer steam sauna will become preventive measures against catarrhal and cardiovascular diseases. Beer steam sauna accommodates 7 people. 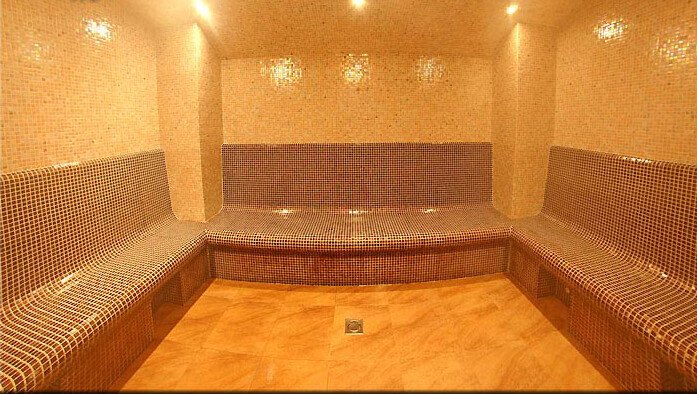 Aroma grotto is a kind of steam saunas where ergonomic seats with infrared warming are at your service. The basis of aromatherapy is the use of natural fragrant oils, which have a positive effect on the human body. Fragrant steam has a relaxing effect. 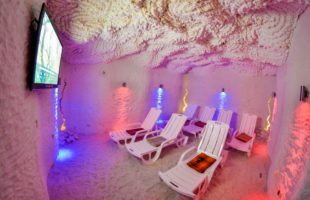 There are unique conditions for permeation of curative fragrants into human body in aroma grotto. 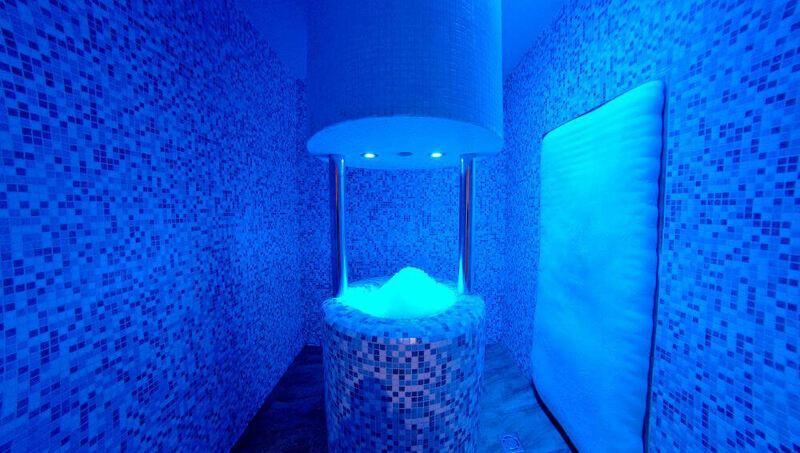 Ice room perfectly tempers and strengthens the immune system. Change in temperature leads to beneficial changes of the state of organs and body systems, strengthens metabolism. And what is the most important – ice room braces up! 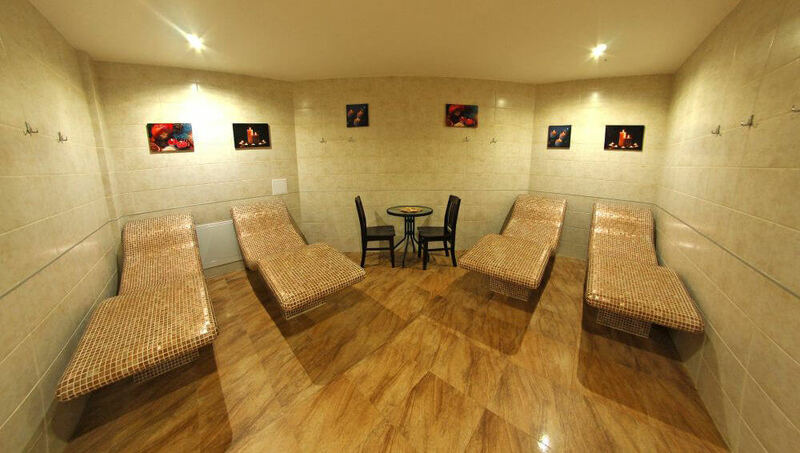 If you are ready to remove the physical stress and get positive charge, the ice room for you. Since ancient times setting up of the body was considered a strange recipe of preserving youth. 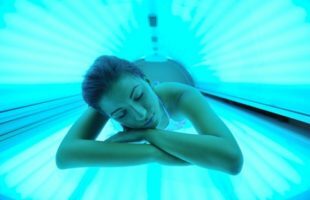 The beneficial effect of contrasting temperatures on the human body was experienced by many nations. Strong heating of the body evokes the desire to cool oneself and vice versa. 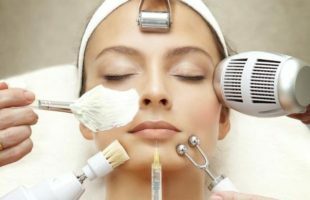 During rotation of such procedures – cooling and heating – temperature balance of body restores. There is circulating filtration and continuous disinfection of water. Ergo loungers with infrared heating serve for deep heating of the whole body, as well as for relaxation and recreation. This improves blood circulation and warm surface has beneficial effect on the central nervous system, spine and musculoskeletal system. Your body and soul will fill with energy, forget about tiredness and strengthen immune system. 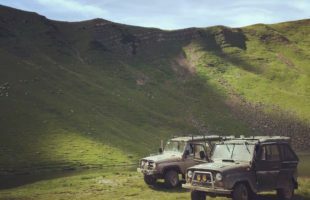 is included in the cost of accommodation! 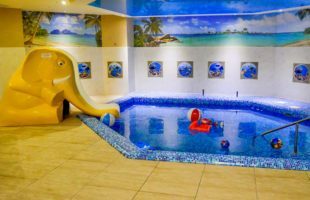 Spa pools for children – 390 UAH. 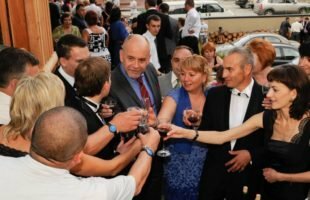 Even better atmosphere of relaxation at spa pool “Romantic Spa Hotel” will be created by a great service of waiters and bartenders. At your disposal there is a lobby bar menu, refreshing drinks and cocktails. 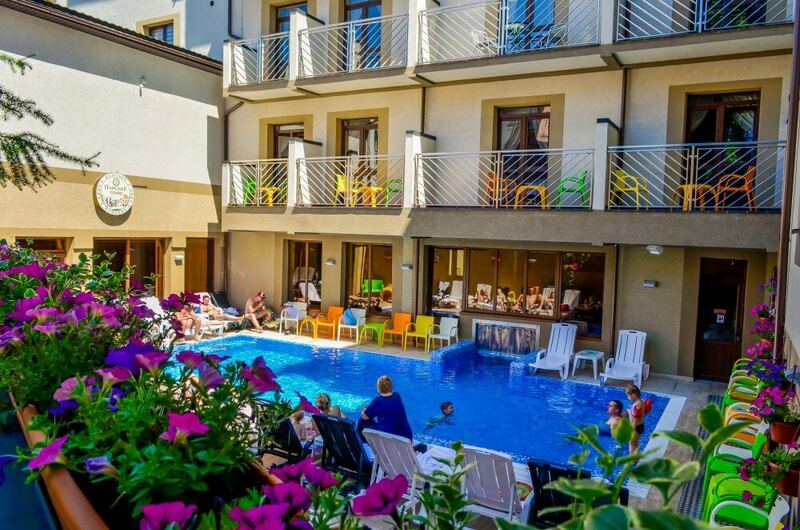 Service is provided on the territory of a spa pool “Romantic Spa Hotel”, Yaremche. Check out time at the hotel “Romantic Spa Hotel” is at 12:00. All services that are included in the price (use of the spa zone) are available during your stay at the hotel, and after the estimated time (12:00) they are fee paying. We request to behave quietly during your stay, so as not to interfere with other guests. Especially in the spa, spa pools, saunas.